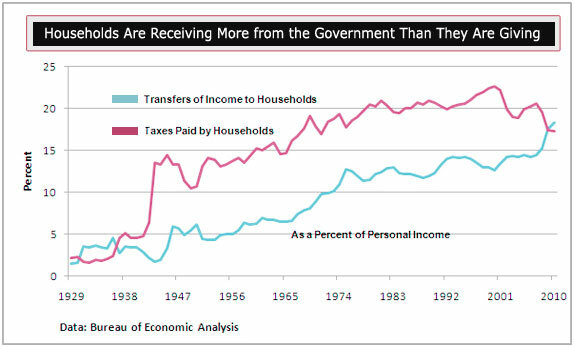 As you can see, government transfers of funds to households exceeded taxes paid by households as a percentage of personal income. For the first time since 1936. And the gap is growing. In raw numbers, in February of this year, households received $2.3 trillion in income support from unemployment benefits, Social Security, disability insurance, Medicare, Medicaid, veterans' benefits, education assistance and other cash transfers of government funds to individuals. The same month, households paid $2.2 trillion in income, payroll, and other taxes. The difference was nearly $100 billion, or around 1% of personal income. If you want a rough guide as to where we stand in the playing out of this recession (assuming you don't concur with the government's declaration that it's over), this chart probably serves the purpose as well as anything. Note that the red line was below the blue one for 1931-36. If a similar period is in store this time around, then we're only about two-fifths of the way into a five-year downturn. Consider also that, since 2007, household income tax payments have fallen by $312 billion, while inflows of cash from the government have, over the same time period, accounted for 79% of household income growth. The latter number is improving, but in 2010 handouts still amounted to 28% of increased income. In other words, the government is propping up consumers, to a very large extent. It's usually the other way around. By a rather wide margin. On average, through boom times and even moderate recessions, taxpayers part with about 8% more than they receive. The disparity now is reflective of both the severity of our current economic woes and government's responses. People lost jobs and paid less in taxes, a result compounded by a new round of tax cuts. Concurrently, government met demands from programs that automatically kick in, like unemployment benefits, and added a host of additional ones to boot, like the Recovery Act. While we certainly don't view any slackening in the flow of tax money to be a bad thing, the lack of any fiscal accountability on the part of government is. If it takes in less, it should spend less, just as citizens are forced to do. It hasn't, as we know all too well. But there's another aspect to this, too. Yes, consumers have had to do a bit of belt tightening since the economy went south. However, the government has stepped in and taken up a good measure of the slack. That in turn has promoted consumer spending that would not otherwise have been possible among those not allowed to run massive deficits. So what happens when the gravy train slows down? In order for the lines on the graph to revert to their average, about $1.2 trillion in income would have to be added to the economy. No one sees that coming, at least not over the next few years. Jobs simply cannot be created quickly enough. Then, as unemployment benefits, temporary tax cuts, and other stimuli expire, a serious further crimp will be put in people's ability to spend. If this were to take place within the context of a robust recovery, it might not matter all that much. But in today's sluggish job market, it matters a lot. Less spending translates, ultimately, into more lost jobs and the threat of a second - and potentially more severe - recessionary dip. That leaves the government caught in a trap of its own making. With more financial responsibility being demanded by average citizens and members of both parties, another substantial infusion of money (with its attendant prospect of runaway inflation) is going to meet with a lot of resistance. But the temptation is going to be powerful. Because household revenues will drop as government benefits decline, and a prolongation of the recession becomes a certainty. No politician can run for reelection on a boast that he or she choked off the recovery. And many of those screaming loudly at the moment for austerity in Washington will switch sides in a heartbeat when the loss of government benefits affects them personally. So, most likely, some new stimulus program, with a fancy name and reassurance that it is a necessity, is in the cards.